Effective July 2, 2018 the Courthouse will now be open during the lunch hour for access to the Clerk’s Office, Jury Division and the Self Help Division. The Clerk’s office will now be closing from 4:00 p.m. to 5:00 p.m. Welcome to the Third Judicial District Court which encompases Doña Ana County, in the state of New México. Click on the PHOTO for a map of the State Judicial Districts. As a juror you will play a significant role in ensuring that justice is carried out fairly and impartially. Click on JURY INFORMATION or the PHOTO. Are you representing yourself, without a lawyer? The Self-Help Program (Pro Se) can assist you. Click on SELF HELP or the PHOTO for more information. Adult, Juvenile and Family Reunification Drug Court Programs are an alternative to incarceration and give significant community service. Please click on the PHOTO or PROGRAMS, then on PROBLEM SOLVING COURTS to find the three Drug Courts. Have you deposited a cash bail bond? You may be entitled to a cash refund under certain conditions. Click on CASH BOND REFUNDS under Services page or the PHOTO for information. The Third Judicial District Court is a state court of general jurisdiction located in Las Cruces, New Mexico. The Court encompasses the same geographic area as Dona Ana County. 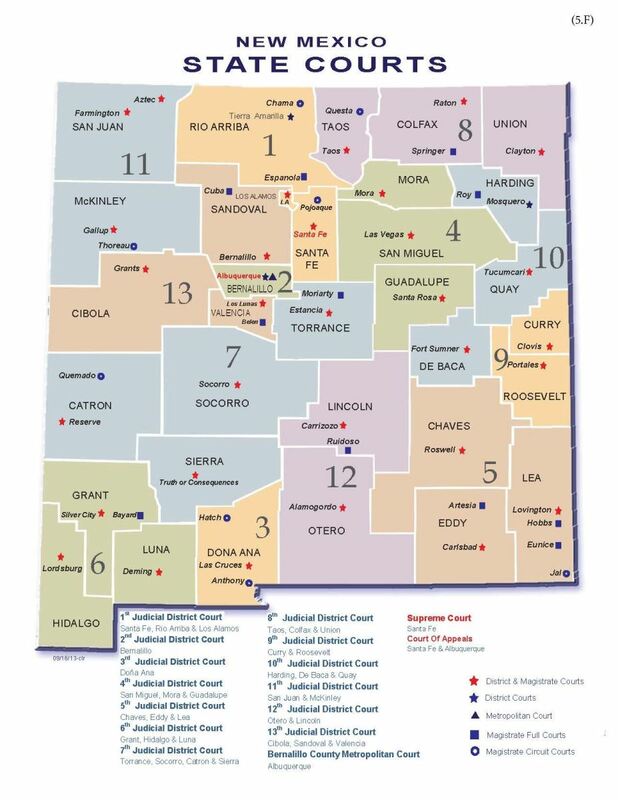 It is bordered by the Twelfth Judicial District (Otero and Lincoln Counties), the Sixth Judicial District (Luna, Grant and Hildago Counties) and the Seventh Judicial District (Sierra, Catron and Socorro Counties). See a map of the state Judicial Districts. The Court has jurisdiction over criminal cases, domestic relations (divorce, child support and custody, domestic violence), probate cases, children's court (abuse and neglect of children, juvenile delinquency, adoptions) and all general civil cases (auto accidents, contract disputes, real property disputes, violation of civil rights). There are eight District Court Judges, one Child Support Hearing Officer and one part-time Domestic Violence Special Commissioner, who hear cases. Please see the Judges page for more information. Chief Judge James T. Martin is the Administrative Authority of the Court. He is assisted by the Court Executive Officer, who is the Clerk of the Court. First: The Court delivers speedy, accurate, impartial, and legally correct decisions and judgments to resolve legal disputes between and among individuals, private organizations, business entities, and State and local government. The Court carries out this core constitutional function through a variety of means including jury trials, bench trials, treatment Court programs, mediation, and alternative dispute resolution. The Court strives for accessibility to all persons and entities whether represented by counsel or pro se (where that is authorized) while adhering closely to the principles of due process and equal protection of the law. Second: The Court maintains current, accurate and readily accessible records of every case brought before it. Such records are maintained with strict adherence to the statutes and Court rules that govern the creation and maintenance of such public and nonpublic records. Finally: In all that it does, the Court makes efficient use of all public resources provided to it by the citizens and residents of the State of New Mexico and is accountable at all times to the public through its representatives for the use of those resources. All persons entering the Third Judicial District Courthouse are subject to security screenings. No weapons of any kind (including penknives on key chains) are permitted in the building. There are no cellphones, smart watches, purses, food, and beverages permitted in the Courthouse. Parties are expected to act and dress appropriately in Court. Shorts, flip flops, tank tops, ball caps and sunglasses should not be worn in the Courtrooms. Parties should refrain from chewing gum while their case is being litigated. Use of tobacco products is prohibited inside the Courthouse. THERE ARE NO JURY ASSIGNMENTS FOR WEDNESDAY, APRIL 17TH THROUGH FRIDAY, APRIL 19TH. NO JURORS NEED TO REPORT. PLEASE FOLLOW YOUR CALENDAR FOR YOUR NEXT REPORTING DATE. Effective July 2, 2018 the Courthouse will now be open during the lunch hour for access to the Clerk’s Office, Jury Division and the Self Help Division. The Clerk’s office will now be closing from 4:00 p.m. to 5:00 p.m. The Court is not open on official holidays. The holiday calendar can be found HERE. Reminders of when the court will be closed are posted at the main entrance and other locations in the court as a public service. Routine financial transactions can only be made until 4 p.m. daily. No financial transactions are accepted after 4 p.m. except in emergencies which affect someone bonding out of jail or other such critical matter. This website was created by the Third Judicial District Court solely as a public service. The Court does not warrant the accuracy of the information displayed by this website nor is it responsible for any errors or omissions and assumes no liability for its use, availability or compatibility with website users’ software or computers. This information is by necessity general in nature and is not intended as legal advice, but rather information which may be useful in understanding how courts in New Mexico operate. For legal advice, you should contact a lawyer.